What is a mini pig? Is there such a thing as a mini pig? 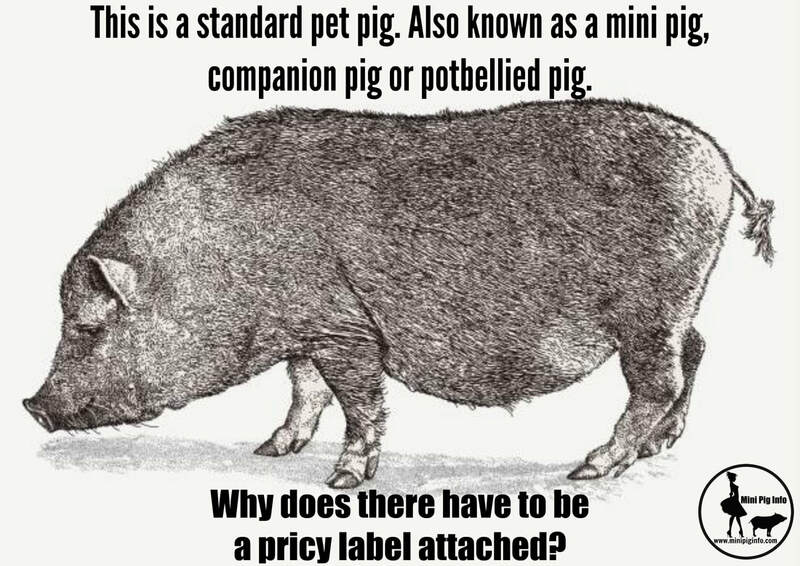 The word "mini" has become the standard to differentiate between farm pigs and the smaller breeds like potbellied pigs. While that term has been accepted, I fully agree that it can be misleading to uneducated people who were never prepared for ANY sized pig. Mini is simply a class of pigs, not a breed of pigs. Potbelly is a breed. Kune-Kune is a breed. And in comparison to farm pigs, they are indeed mini. I also think that term is commonly used because most pigs are mixed breeds. They aren't any "purebred" potbellied pigs anymore. They've been mixed with ferals and kunes and other real breeds, so mini sounds better than mutt pigs. There are breeds of dogs, but when you have several breeds that are bred, what is the offspring called? What if a Dalmatian and Chihuahua breed? A Dalhuahua? How about a Saint Bernard and German Shepherd? A Saint Shepherd? Most are referred to as "my dog", no breed attached. But, the word mini will likely continue to be used to catergorize the actual breeds of pigs that someone as trying to describe as smaller than a farm type pig. Now micro and teacup and nano and pocket and micro mini? Those are unacceptable descriptions, not only are they flat out lies, but they are completely misleading. We started this website because people were searching for "mini" pigs and it made sense to name the website a commonly searched term so it showed up when anyone was looking for info for their mini pig. However, once they actually read our website, even on the home page, it let's people know why it's called mini pig info, and how that term by itself can be misleading. We dedicated a page on the website to show others what realistic sizes of "mini" pigs are. You can see their stories and pictures by clicking here. I would much rather have started a website called www.MyPigWasSupposedToBeMiniButEndedUpBeingAFatass.com, but that was obviously too much for people to type in the browser and also not something people would be searching for. I do not condone, support or endorse breeding, though admittedly, before I even knew about pig rescues, I purchased my pig. Had I known there were people out there that brought in pregnant pigs and worked with pigs so they could be adopted? I never would've purchased the love of my life that I have now, I would've submitted an application like anyone else and adopted. It's bitter sweet for me, I couldn't be happier with my pig (on most days. lol) but I do wish I had been exposed to the rescue side of pigs before I purchased a pig. I do understand that some want a piglet and not a grown/mature pig. You don't have to buy a pig from a breeder if you want a piglet. Pig rescues have piglets. There are rescue networks that know about piglets that need excellent homes. There are people who have purchased piglets that quickly found out they weren't prepared for a pig and that piglet now needs a new home. Trust me when I say, piglets aren't always fun. Are they cute? Absolutely! But they are hard work. There is typically a process to adopt a pig versus buying one from someone who only cares about money. The people who have dedicated their time, resources and homes to foster these pigs have a legitimate concern about where they will go. They are emotionally vested in these pigs. So, while it may be "easier" to simply buy a pig, you are rewarding someone for bringing more potentially unwanted pigs into the world which keeps the process going and going. NOBODY can guarantee the health of your pig. Not a breeder, not a rescue, no one. ANY pig can become ill, any pig can carry traits passed along from many generations before that aren't dominant genes in other siblings or the parent pigs. If size is of the upmost importance for a pet, then a pig is likely NOT the pet for you, however, if there are city/county restrictions on the sizes of pets/pigs that are allowed, your best bet would be to rescue an older pig that is "fully grown" so there are no surprises. Just keep in mind, while the growth plates in the bones will eventually close and your pig may not get taller or longer, your pig will continue to gain weight if the diet isn't balanced and the amount of calories that are being consumed are more than the calories being burned off. Diets constantly have to be adjusted, so your pig doesn't become obese as they grow older, less active, arthritic, etc. (Diets also need to be adjusted when a mini pig is too skinny) Click here to read more about nutrition. Again, had I known about pig rescues when I purchased my pig, I probably would've gotten a rescue pig instead of purchasing a pig from a breeder. To find a pig rescue, you can look at the list we have created by clicking here. I've rescued, I've fostered, I've transported, I've volunteered at pig rescues, I've donated time and money to various pig rescues, organizations, charities and will continue to educate, advocate and help in any way possible. I do not believe there are ANY healthy super small pigs, but I do know there are people who have unrealistic expectations and that they will find one. Unfortunately, 99.9999% will be disappointed and ultimately need to find that pig a home because that pig grew bigger than the little dainty cute pig they wanted, they don't understand pigs nor do they want to learn how to properly care for one. Those who have a passion for pigs and do everything in their power to help will also continue to help and educate people. I truly believe it is a community effort, it's sad that not everyone takes the time to truly learn about these precious creatures BEFORE they get one, myself included. The pig community is a family, a large, sometimes dysfunctional family, but that's no different that my human family. I have learned so much from other pig people and I am quite certain I will continue to learn on a daily basis. I just hate that everyone that is in the community is divided more and more everyday and having to fight with each other when it's not us who are the problem. It's the people who continue to lie, deceive and basically rob people, that need to take the brunt of the hatred, not each other. In the meantime, while mini doesn't accurately describe what the size of your pig will be, it does represent a group of pigs that we have all come to know and love. So when someone says there is no such a thing as a mini pig, they're both right and wrong. There is a miniature sized pig, also known as a mini pig or potbellied pig, but these pigs are anything but mini. This term only describes a class of pigs that are smaller than the farm pigs, but these do NOT describe actual breeds of pigs nor the size of the pig you will end up with. You can read more about actual breeds of pigs by clicking here. Do not add a pig to your family if you're not prepared to make a 20+ year committment to a big ball of fun because that is likely what you will end up with. The journey to get there is long and draining, but once your pig becomes part of your family, you will become a parent to an unconventional pet that will steal your heart forever.